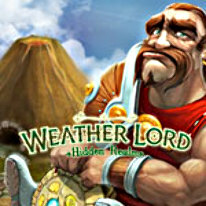 There's a 100 percent chance of FUN when you play Weather Lord, a unique time management game that puts the forces of nature at your fingertips and then challenges you to complete tasks on 40 thrilling levels! Use sunlight, wind and rain to coax bumper crops out of fertile soil, and then turn your harvest into the products people want. If you manage your resources well, your Solar Power Stations and Wind Turbines will provide the energy your production facilities need. You'll also have to summon thunderclouds to remove boulders, send rain to quench forest fires and store up the resources your workers need to repair earthquake damage. If you stay ahead of the clock, the gold cup will be yours! Give Mother Nature a well-deserved rest - play Weather Lord today!